Doug’s Guide Service, LLC is located on Lake Moultrie in Bonneau Beach. 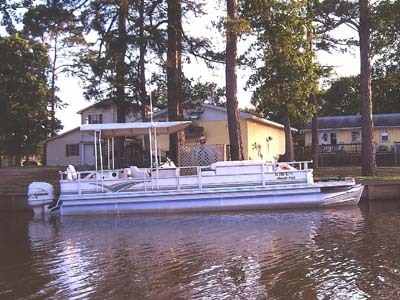 The pontoon is presently kept at our home at 112 Saracen Drive. This site can be found by turning off Highway 52 in Bonneau, SC at the Exxon station onto Black Oak Road. This road, which heads west, is the only road out to the lake at Bonneau Beach. The last paved road before the lake is Butter Rd., across from the entrance to the Boat Ramp and beside the Lakeside Restaurant. Turn right on Butter Road and go four short blocks to Saracen Drive. Turn left on Saracen Drive and come to the end of the road, the grey house. If you are coming down I-95, get off in Florence, SC at the Highway 52 (exit 164) and head south. After going through Florence, it is a 4-lane highway most of the way, and the distance to Bonneau is approximately 73 miles. When in Bonneau, use the directions outlined above. Estimated time from Fayetteville, NC is 3 hours. If you are coming down I-26, get off on Highway 301 East (go under the bridge and turn right to circle back east) and go about 17 -20 minutes and you will empty onto I-95 going north. Go north for one mile and get off at Santee on Highway 6 (exit 98). Turn right and head east. Highway 6 will merge with Highway 45 in Eutawville. Approximately 23 miles down the road from Santee, you will come to a yellow flashing light in the Cross community. Highway 6 and Highway 45 will split. Take Highway 45 to St. Stephen. At the red light in St. Stephen, turn right onto Highway 52 and head south to Bonneau, approximately 10 miles. When in Bonneau, use the directions outlined above. Estimated time from Columbia, SC is 2 1/2 hours.